Do you have any odd items that you always keep in your refrigerator? In our household there are a couple of strange staples we added to our meager repertoire this summer. Oh yes, Brent always needs his milk, and we keep half and half and veggies along with eggs. But what about strange things that cause great remorse if they are absent? The creamy thick substance is sweet and full of calories. I like to put my finger in the container or double dip the spoon; however, my ‘non double dipping’ husband won’t have it! He insists that a new spoon be used each time the fluff is removed from its container – something to do with germs? The silky, creamy, smooth texture adds to the sweet’s delectable qualities. This scrumptious delicacy is homemade cream cheese frosting! Strawberries are my all time favorite accompaniment with this treat. I’m not big on desserts, but this frosting is something to crave. What we like about it, is that unlike ice cream, when you mix the strawberries and frosting, the strawberries can’t freeze. Don’t get me wrong, we like ice cream and strawberries, but there’s something about the way the strawberries freeze in ice cream that is just wrong. This wonderful frosting will last in your refrigerator for a few weeks if you don’t eat it all at one time! You’ll often find me skipping the strawberries and digging a spoon deep down to get a shovel full because I know that the ‘double-dip nazi ‘ might be on the lookout. I really should try to freeze this frosting on a stick (or spoon), but I won’t put a healthy strawberry in it – just wouldn’t be prudent. 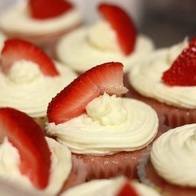 Imagine strawberries and cream cheese frosting on cupcakes….subtract the cupcakes and consume a dozen. Heaven. 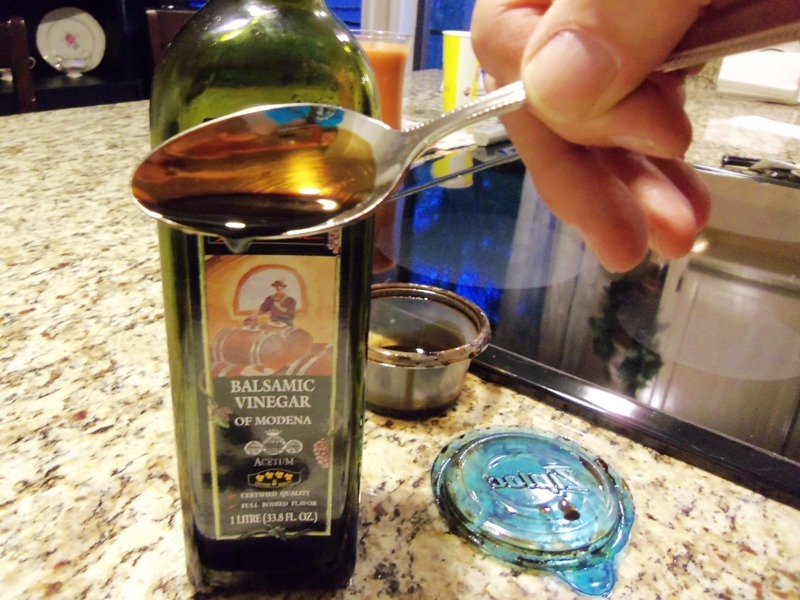 The second odd staple we keep (and my current favorite) is balsamic vinegar reduction. Brent is not as keen as I am on this treat, but he is a willing participant in this mouth watering surprise. If you haven’t ever taken a couple cups of high quality balsamic vinegar and reduced it down by 60 or 70%, you are really missing out. This thick molasses-like syrup is delicious on salads, fish, vegetables, and believe it or not, it is great on peaches and strawberries. I don’t always put cream cheese frosting on my strawberries – sometimes I use vinegar! Peaches are fabulous with this sticky substance drizzled all over them. My healthy choice of balsamic vinegar reduction is more versatile than the frosting. It’s getting tough to find good strawberries at reasonable price anyway. OK, that’s it. I’m taking frosting off the staple list. Thanks for the healthy therapy session. ‘…whatever is true, whatever is noble, whatever is right, whatever is pure, whatever is lovely, whatever is admirable—if anything is excellent or praiseworthy—think about such things’. (Philippians 4). I’m sure this verse must be referring to icing and balsamic vinegar. Winter is on the way and I’m looking forward to citrus, and I’m afraid the cream cheese frosting is taking a back seat for awhile. Maybe my sweet tooth has toned down for the cold weather. Healthy is better anyway. Right? What kind of odd staples do you keep in your refrigerator? Do you have to run to the store for bread, milk, balsamic vinegar and cream cheese? I need your easy secrets to bring culinary delight to our winter! I LOVE cream cheese frosting. How did we not know that we share this obsession? On carrot cake or not. I used to like to make a plain white or yellow cake and slather it with cream cheese frosting. Haven’t tried strawberries yet, but I will! My keep-around is the oh-so-convenient refrigerator packages of mashed potatoes that are in grocery stores nowadays. They’re my ultimate comfort food when I’m feeling bad. With lots of butter, of course! Yes Linda…You know I love mashers too…and your risotto… The tub of mashers are not quite as good as homemade, but so much easier especially when you don’t feel well.